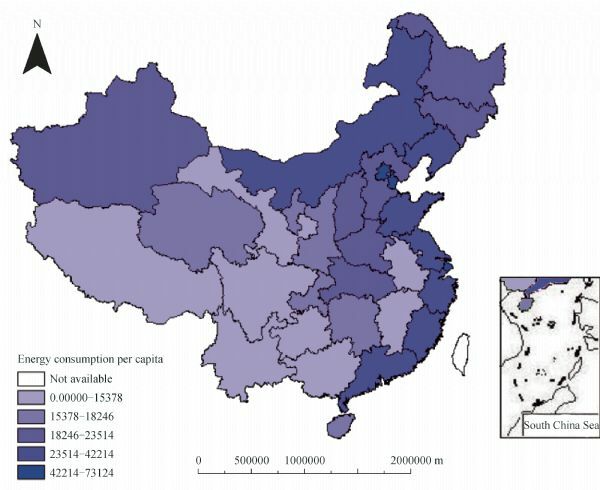 Coupled with intricate regional interactions, the provincial disparity of energy-resource endowment and other economic conditions in China have created spatially complex energy consumption patterns that require analyses beyond the traditional ones. To distill the spatial effect out of the resource and economic factors on China’s energy consumption, this study recast the traditional econometric model in a spatial context. Several analytic steps were taken to reveal different aspects of the issue. Per capita energy consumption (AVEC) at the provincial level was first mapped to reveal spatial clusters of high energy consumption being located in either well developed or energy resourceful regions. This visual spatial autocorrelation pattern of AVEC was quantitatively tested to confirm its existence among Chinese provinces. A Moran scatterplot was employed to further display a relatively centralized trend occurring in those provinces that had parallel AVEC, revealing a spatial structure with attraction among high-high or low-low regions and repellency among high-low or low-high regions. By a comparison between the ordinary least square (OLS) model and its spatial econometric counterparts, a spatial error model (SEM) was selected to analyze the impact of major economic determinants on AVEC. While the analytic results revealed a significant positive correlation between AVEC and economic development, other determinants showed some intricate influential patterns. The provinces endowed with rich energy reserves were inclined to consume much more energy than those otherwise, whereas changing the economic structure by increasing the proportion of secondary and tertiary industries also tended to consume more energy. Both situations seem to underpin the fact that these provinces were largely trapped in the economies that were supported by technologies of low energy efficiency during the period, while other parts of the country were rapidly modernized by adopting advanced technologies and more efficient industries. On the other hand, institutional change (i.e., marketization) and innovation (i.e., technological progress) exerted positive impacts on AVEC improvement, as always expected in this and other studies. Finally, the model comparison indicated that SEM was capable of separating spatial effect from the error term of OLS, so as to improve goodness-of-fit and the significance level of individual determinants. Lei JIANG,Minhe JI,Ling BAI. 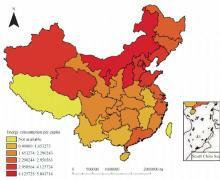 Characterizing China’s energy consumption with selective economic factors and energy-resource endowment: a spatial econometric approach[J]. Front. Earth Sci., 2015, 9(2): 355-368. Fig.3 Spatial distribution of per capita GDP (CNY/per person) by province (2008). Hualin XIE, Chih-Chun KUNG, Yuluan ZHAO. Spatial disparities of regional forest land change based on ESDA and GIS at the county level in Beijing-Tianjin-Hebei area[J]. Front Earth Sci, 2012, 6(4): 445-452.